KOKOMO, Ind. – The Indiana University Kokomo women’s volleyball team received a major individual award when Micayla Speidel was named First Team All-Region by the American Volleyball Coaches Association. The Columbus East graduate was also named Freshman of the Year in the northeast region. Speidel was humbled by the national recognition after her first collegiate season. IUK head coach Heather Hayes praised Speidel for her hard work and dedication in earning this prestigious award. “I am extremely proud of Micayla and excited for her. I do not think people understand how elite of an honor this is. She has worked very hard, and I am happy she is receiving recognition for her efforts,” Hayes said. Speidel led the Kentucky Intercollegiate Athletic Conference in kills with 520 kills (12th in the NAIA) and averaged 3.69 kills per game to help lead the Cougars to 28 victories – the most in school history. Hayes recognized that the coaching staff put a lot of responsibility on Speidel, but they knew she could handle the pressure. The Cougars finished the year with a 28-11 record and a fourth place finish in the KIAC. Speidel and Hayes understand the significance of the award for its young program, which just finished its third season of competition. In its first two seasons, the program had records of 3-16 in 2011 and 9-25 in 2012. Speidel was not the only leader on the team, though. Several players ranked highly in the KIAC and NAIA. 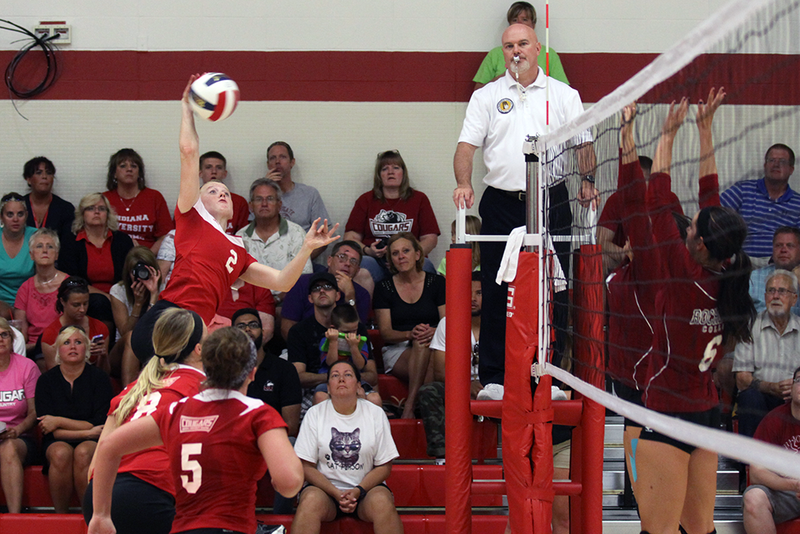 As a team, IU Kokomo had 263 service aces which ranked sixth in the NAIA. Pioneer graduate Cortney Hanson dished out 1,115 assists (second in KIAC) and averaged 9.78 assists per game (35th in NAIA). Junior captain Lael Burrus finished the year with 552 digs (seventh in KIAC) and Megan Riley finished fifth in the KIAC with 90 blocks. Kaitlyn Emery was second on the team with 326 assists, Maconaquah’s Keeana Walton accumulated 47 blocks, Kaley Harness led the team with 67 aces, Kaleigh Ensley earned 63 aces and Teylor Rains added 36 aces. Hayes credited Burrus, Harness and Allen for instilling a “hard-nosed work ethic” with the team that helped them exceed preseason expectations. The Cougars were picked to finish eighth in the KIAC in the preseason in part because of having too many freshman. Hayes said the freshman came to IU Kokomo to help in “building a tradition” and that they made tremendous improvements during the season. “There is no question they made a significant impact to our program. They added more athleticism and a competitive spirit to compliment the players who were returning,” Hayes said. Kaley Harness was one of the six freshmen to join the team and said the biggest difference between high school and college was that opposing players were “bigger, stronger and faster at this level.” Burrus was not worried about the freshman adjusting to the college game, however, and knew they could compete in the KIAC. All in all Hayes was thrilled with her first season as head coach and enjoyed the way the entire team played this season. The Cougar volleyball team has returned to campus for the spring semester and has already begun conditioning as they start preparations for the 2014 season.